Danny Young is 13 years old and in the 8 th grade. He began playing the violin when he was 5 years old and joined Kadima’s orchestra program at his elementary school. 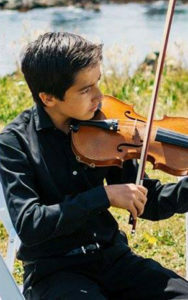 He is now the Concertmaster of the Kadima Senior Philharmonic, Assistant Concertmaster of the Kadima Conservatory Philharmonic, and the Concertmaster of the Advanced String Orchestra of Millikan Middle School. Danny is also a proud member of the Master Class of Beth Elliot and Eric K.M. Clark and is a recipient of the 2017 Jack Kesselman Orchestra Award. In his free time, Danny loves to play electric guitar in his school’s jazz band and in Tangent, the rock band he formed with fellow Kadimans. He also enjoys playing acoustic guitar with his teacher, Pepe. Danny also likes to read, play soccer, hike with his family and friends, and play with his two dogs, Langely and Sierra, and his two cats, Mini and Michi. nurturing his love of making music and for making music fun.